She went down stern first, her bow shot in the air and then came down with a sucking sound. This dramatic description signalled the end of the Fleetwood trawler Ida Adams – but her 12 man crew (and a dog) were saved. 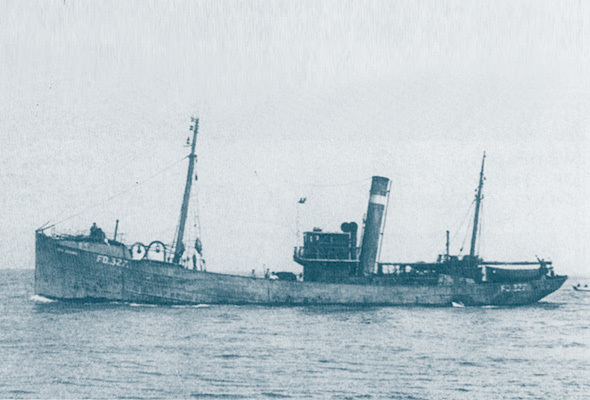 It was November 1930 that the vessel was on her way home from a successful fishing trip. In thick fog and drizzling rain, the 125ft trawler was steaming home. It was 5.15am and the cook was preparing breakfast. Suddenly the 125-ton Ida Adams hit the rocks and ran aground on Frenchman’s Rock in Sound of Islay on the west coast of Scotland. There was a severe impact and the crew were thrown about in all directions. But there was no panic. A blaze started in the galley as some fat from the fish on the stove was thrown into the fire. The cook put out the blaze and rushed on deck. But when he returned to collect his belongings he found himself wading thigh deep through murky seas. Soon after striking the rocks the ship’s engineroom and bunkers filled with water and the lights went out. With decks awash, the crew remained aboard for about an hour making desperate attempts to stem the flow of water. But the trawler was sinking and Skipper William Atkinson ordered his crew to grab what they could and take to the ship’s boat. Difficulty was experienced with the boat which was being thrown against the trawler due to heavy swell. The crew – and the skipper’s dog Bruce making his first voyage – got safely aboard. As they watched, the Ida Adams rose and fell as the Atlantic rollers lifted and dropped her back on the jagged rocks. Every bump tore open the iron hull plates and the ship eventually slipped into deeper water. Returning home, the crew praised the people of Portna-haven for their hospitality. The fishermen had rowed four miles to reach land where they were taken into local cottages and given dry clothing and a hot meal. Later they walked to the nearest village and were taken by car to Port Askraig where they were put up in a hotel before taking two steamer trips to reach Garnoch and complete their trip home by train. The skipper stayed near his ship to help any salvage attempts but weather conditions prevented a rescue operation. It was reported that the trawler which had sailed out of Fleetwood for several years, had sunk in 12 fathoms. Ida Adams was owned by Messrs Noble Bros and was built in 1907. First published in Life in Fleetwood issue 28, spring 1993.